Central Utah Water Conservancy District » Reaching out! On Sept. 23, our Central Utah Water Conservancy District’s staff and their families arrived in great numbers, with children and grandchildren in tow coming to what they thought was a wonderful day at the Loveland Living Planet Aquarium in Draper. 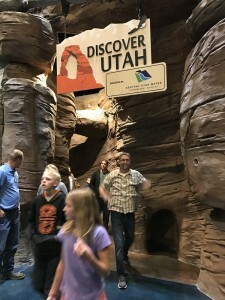 But they were in for a big surprise – the night turned into a celebration of CUWCD’s continuing outreach and education alliance with the aquarium, including an acknowledgement of the district’s support by renaming its “Discover Utah!” exhibit. The aquarium has really become an integral part of the community, “especially in an inland state like Utah,” said CUWCD Assistant General Manager Christine Finlinson. Before the current park opened on March 23, 2014, it was housed in a revamped craft store, “and prior to that, there was a miniature aquarium in Downtown Salt Lake City,” Finlinson said. That was about the time the district approached Brent Anderson about creating a partnership that became the Utah Waters Van, educating local fourth-graders about the water cycle, wetland ecosystems and water conservation, using demonstrations, experiments and live animals. “… it has grown so much larger,” CUWDC Gene Shawcroft told the assembled staff on Sept. 23. “Since their start in 2002, the Utah Waters Van has reached over 340,000 students in all (of Utah’s) 42 school districts. Among the plans, Anderson said, are vodcasts that open the topics spread by the Utah Waters Van to an even wider audience, a game engine that allows the aquarium to create a video wetland and pond where users can adjust the population and other factors and monitor the resulting changes, and a new science learning center at the aquarium that will include an outdoor stream and other water-conservation stations. It is critical, he said, for Utahns to recognize smart ways to conserve water and also ways to be yet developed. “We are starting to build on these ideas right now,” he said. As for the CUWCD, “it’s always been part of our mission to educate the people of Utah and that’s what we’ve done with the aquarium’s help, starting with fourth graders,” Finlinson added. It all comes back to the district’s ongoing stewardship of its part of Utah’s environment, Hoyt said.